Writer Greg Pak starts off Batman/Superman Vol. 1: Cross World with a riff on the "dual narration" that Jeph Loeb used on Superman/Batman, and that nostalgic touch immediately made me feel at home on this title. At the same time, while Ed McGuinness's boisterous, cartoony art was perfect for the original early 2000s title, Jae Lee's art deco steampunk whimsy makes this title feel different than what came before, more mature in keeping with the ultra-modern New 52. Cross World is strong on words and pictures, a little less so on plot, but it perfectly captures the kind of story one expects from this title. Between Lee's winding, twisting Gotham and some of the liberties that Pak takes -- a drug dealer offers Clark Kent some "kind bud"; a little kid flips off Superman just out of panel -- the new Batman/Superman series almost has a "mature readers" feel to it. It's a presentation considerably different than the wild superheroics of Jeph Loeb's Superman/Batman (reflecting, perhaps, the greater Batman influence here and the greater Superman influence there); which is OK for this day and age; the gritty "realism" of Batman/Superman is probably about what the Batman vs. Superman movie producers are shooting for, too. Pak uses Loeb's aforementioned narration style for the story (even gives Loeb a nod in the bonus commentary section), and it's a wonderful reminder that the old DC Universe isn't gone-gone, just re-presented in new ways. Like Superman/Batman Vol. 1: Public Enemies (and, presumably, like the forthcoming movie), Cross World touches on the similarities between the two heroes' origins before moving on to the main action. Another nice bit is Pak and Lee depicting Bruce Wayne in his army fatigues get-up, such that most readers will recognize this as set squarely in the Year One era even before Superman leaps instead of flies. Pak also riffs on Loeb and Tim Sale in a flashback sequence mid-way through the book, drawn by Yildiray Cinar, that depicts the first meeting as children of the Earth-2 Clark Kent and Bruce Wayne. Loeb and Sale did this in a Superman/Batman Secret Files, showing Alfred Pennyworth's limousine breaking down in Smallville and a Clark seeing a newly-orphaned Bruce in the back seat. Here, Pak actually has Bruce get out of the car, and the two lonely kids start a friendship that lasts to their superhero days. Earth-2 is an alternate reality -- as, indeed, is the entire post-Flashpoint DC Universe -- so it's nice perhaps to think that Loeb and Sale's events still "happened" and that Pak's is a true alternate version of them. The Cross World story is imperfect but cute, especially when "our" Superman and Batman encounter their older, wiser Earth-2 counterparts. It's a bit like the recent 2009 Star Trek movie, where Spock-Prime tells Jim Kirk that he and that reality's Spock will be friends; we know and the older characters know where this ends up, and it's fun to see the younger characters at the beginning of the ride. Also, my gold standard for Superman/Batman team-ups is Dave Gibbons and Steve Rude's World's Finest, mainly because of how they team not just the heroes, but their respective Super- and Bat-families; Batman/Superman doesn't go so deep as, say, Perry White and Jim Gordon, but that Cross World has a couple worlds' worth of Catwomen on the Batman side and Lois Lane and Wonder Woman on the Superman side is a good start. In the nitty-gritty details of the plot, however, Cross World stumbles a little. That the Earth-1 and Earth-2 Supermen and Batmen fight and then team-up is fine, but the details get jumbled when the story introduces a magical all-powerful crystal and also a government super-weapon. Was the military already planning to use the weapon against Superman? Was it the influence of the story's villain du jour, Kaiyo the Trickster, or did this all start because there was suddenly a "rogue" Superman on Earth-2? Such isn't clear, as if the plot is in some ways despite the point. Also, even with great panel-work by Lee (like an edgier J.H. Williams) and letterer Rob Leigh doing a yeoman's job depicting four or five different character's narrations, it's sometimes tough to tell which Earth's hero is doing what. Kaiyo isn't a terribly rousing villain, perhaps because she's a "trickster" and doesn't pose a real threat besides bringing chaos (at one point I thought Pak might reveal Kaiyo as Mxyzptlk or one of his ilk, but that doesn't turn out to be the case). More surprising and disappointing is that the end of this story and the Villain's Month Darkseid issue that follows doesn't match up with Justice League Vol. 1: Origin, supposedly the most seminal of New 52 stories; in Origin, Darkseid is on Earth looking for his daughter, whereas Cross World suggests that Darkseid is simply reveling in combat with various dimension's Supermen. If Kaiyo is meant to be the "daughter," such is also not made clear, and I'd have to say I was expecting someone more impressive to fit that role. The Darkseid issue is entertaining in that Pak posits Darkseid as kind of a New Gods' Prometheus, stealing the fire from the old gods in a role we might otherwise consider a "good guy." How Darkseid became a despotic ruler isn't revealed here, nor the origins of the Parademons, Desaad, and others (not sure; did Kirby even reveal those origins? ); what Pak has is a good start and I wouldn't mind seeing Pak continue with other "tales of the New Gods" later on. Batman/Superman Vol. 1: Cross World finishes with some dynamite extras, most notably a script-to-pages sequence with commentary from Pak, Lee, and the series editors (I'd love to see more "director's cut" material like this in the trades). Obviously DC considers this an important book, and the reasons why are also obvious (chances are, by hook or by crook, they'll keep this book going until at least 2016). Cross World gets a little loopy by the end (and, wouldn't you know it, all the characters forget the adventure in the end, too), but I can't say that's terribly different than some of the stories in Superman/Batman previously. Batman/Superman is faithful to Superman/Batman before it, and despite some difficulties, that rates it pretty highly in my book. I agree there should be more "director's cut" stuff in trades. I love reading some of the original scripts, and notes they make along the way, along with the concept art. I always look forward to these. The series doesn't have that strong start like Public Enemies, or Supergirl, but I have the feeling once it finds it's footing after the "First Contact" crossover, it'll be a much better series overall. Especially if it's Post-Forever Evil and Superman Doom. 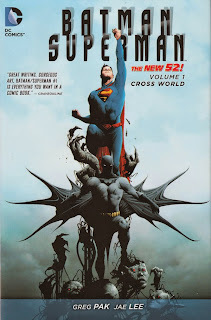 Am I just seeing things because of the book's title, or do Superman and Batman form an upside-down cross on that trade cover? I'm currently working on reviewing Astonishing Spider-Man and Wolverine, which I wish they'd bring back as an ongoing team-up title similar to Batman/Superman. Both characters have their own individual team-up series (Spider-Man Team Up and Savage Wolverine, respectively), but Astonishing really plays them off of each other nicely. I had a quick glance at the credits for all of the Batman/Superman issues thus far and it appears that they're having Jae Lee draw an arc, then take an arc off (Brett Booth drew #5-7, as well as the Villain's Month issue of Doomsday), which is probably a smart strategy as Lee's the kind of artist who has trouble hitting monthly deadlines. That being said, and I've said this before, I really wish that DC would just assign a permanent fill-in artist ala Tony Akins on Wonder Woman or Trevor McCarthy on Batwoman on titles whose artists have consistently struggled with monthly books throughout their careers (I'm looking at you, David Finch). I had actually thought Booth was semi-permanent on the title; an arc with Lee, an arc with Booth, then back to Lee, etc. Certainly a big difference between Booth and Lee's styles, as opposed to Akins and Chiang. Booth is the new artist on Flash, but I'm not sure I could think of an artist who is more different then Jae Lee. It was really jarring & completely took me out of the book. I just read this book for the first time last night, and it made me feel old. I had a REALLY tough time reading the captions, particularly in the first issue. Tiny script with not enough contrast. Otherwise enjoyable, though not as good as I was expecting. Definitely better than Justice League: Origin. Wouldn't mind seeing this as an animated movie.